At Certified Automotive Repair, our experienced and hard-working mechanics make sure you get the best transmission repair in Salem, OR. Our work on transmissions ensures that our customers get the get our customers from point A to point B. We take care of the work on transmissions Salem OR residents can rely on to drive safely. If your car shows any of the signs listed below, come into our repair shop today for a tune-up, inspection, and free estimate! The longer you wait to fix your transmission, the more problems you have down the road. Transmission problems can worsen the more you drive on damaged parts. At Certified Automotive, our mechanics are well versed in automatic transmission repairs. We’ll diagnose what’s going on under the hood, and come up with free and honest estimates down to the penny. We take good care of your vehicle so that you don’t have to worry about more significant problems down the road. For manual drivers, it’s no secret that driving stick requires more frequent transmission check-ups and repairs. To get the most out of your coup or diesel truck, take your car to our shop today for a free estimate and inspection. That way, if there’s anything wrong, we can troubleshoot your transmission problems and find a solution so you can get back on the road. 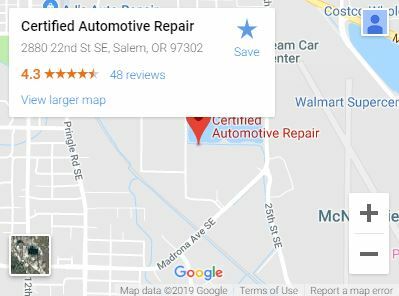 Since the early ’90s, Certified Automotive Repair has served the greater Salem, Oregon community with top-quality car maintenance and mechanic services. But don’t take our word for it–our customers say it best!